+ Are eggs very versatile? + How Often Does A Hen Lay An Egg? The entire time from ovulation to laying is about 25 hours. Then about 30 minutes later, the hen will begin to make another one. Approximately 300 eggs per year per hen house are produced under controlled conditions,depending on the management and the health of the chicken. Bloodspots are caused by a rupture of one or more small blood vessels in the yolk at the time of ovulation. It does not indicate the egg is unsafe. Is a sign the eggs is very fresh. A clear egg white is an indication that the egg is aging. Indicates spoilage due to Pseudomonas bacteria. Some of these micro organisms which produce a greenish fluorescent, water-soluble pigment are harmful to humans. Varies in shades of yellow depending on the diet of the hen. A hen that eats a wheat-based diet produces eggs with light yellow yolks. A hen that consumes a corn or alfalfa-based diet produces eggs with dark yellow yolks. Yolk colour is not an indicator of nutritional value. 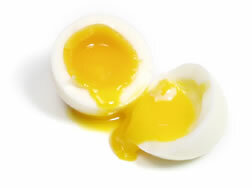 This is a sign of overcooking, and is caused by sulphur and iron compounds in the egg reacting on the yolk's surface. Scrambled eggs cooked at too high temperature can also develop a greenish cast. The green colour is safe to consume. + What Causes Double-Yolk Eggs? Double-yolk eggs are often produced by young hens whose production cycles are not yet completely synchronized. A hen will sometimes produce double-yolk eggs at the very beginning or near the end of her reproductive life due to hormonal changes. When this happens, the shell forms around two yolks instead of one. Genetics is also a factor. Occasionally a hen will produce double-yolk eggs throughout her egg-laying career. It is rare but not unusual for a hen to produce an egg with no yolk at all. Double-yolk eggs are safe to eat and cook with. + How Can You Tell If an Egg is Raw or Hard-Cooked Without Cracking It Open? Place the egg on its side and spin it around with your fingers. A hard-cooked egg will spin smoothly and rapidly. A raw egg will wobble and spin slowly because the liquid center will prevent the egg from building up momentum to keep it turning. + Are Brown Eggs More Nutritious Than White Eggs? Brown and white eggs have the same nutiritional value. Shell colour depends on the breed of hen that lays the egg. + Can Eggs Be Eaten After The Best Before Date? The Best Before date is not the expiry date. If they have been kept refrigerated, eggs can be eaten for a short time after the Best Before date. However, keep in mind that the Best Before date indicates the length of time the eggs will maintain Grade One quality. + Can I Use Cracked Eggs? Because the shell of the egg protects the contents from contamination, it is recommended to buy clean, uncracked eggs. If you find an egg with a broken shell you can still use it with care.Break the cracked eggs into a clean container, cover it tightly, keep refrigerated, and use within two days. If eggs crack during hard cooking, they are safe. + Why Do Hard Cooked Eggs Spoil Faster Than Fresh Eggs? + Are The Eggs We Buy Fertilized? Most eggs we sell today are infertile; roosters are not housed with the laying hens. If the eggs are fertile and cell development is detected during the candling process, they are removed from commerce. + What Makes Hard-Cooked Eggs Hard To Peel? Candling is the process of using light to help determine the quality of an egg. During candling, eggs pass over a conveyor belt and pass over a light source where the defects become visible. Defective eggs are removed. + What Are A Thousand-Year-Old Eggs? "Hulidan" results when eggs are individually coated with a mixture of salt and wet clay or ashes for a month. This process darkens and partially solidifies the yolks, and gives the egg a salty taste. "Dsaudan" eggs are packed in cooked rice and salt for at least 6 months. During this time, the shell softens, the membranes thicken, and the egg contents coagulate. The flavour is wine like. "Pidan" a great delicacy, is made by covering eggs with lime, salt, wood ashes, and tea infusion for 5 months or more. The egg yolks become greenish grey and the albumen turns into a coffee-brown jelly. Pidan smell ammonia-like and taste like lime. + Can Pickled Eggs Be Kept For A Long Time? Pickled eggs are hard-cooked eggs marinated in vinegar and pickling spices, spicy cider, or juice from pickles or pickled beet. Unopened containers of brined eggs (marinated, hard- cooked eggs) can keep for several months on the shelf. After opening, keep refrigerated. + How To Store Eggs? Eggs should be stored in a cool, dry place. Take eggs straight home and store them immediately in the refrigerator set at 4.5°C or below. Keep them in their carton and place them in the coldest part of the refrigerator. Don't wash eggs that could remove the protective mineral oil coating and increase the potential for bacteria on the shell to enter the egg. If eggs crack on the way home from the store, break them into a clean container, cover it tightly, keep refrigerated and use within two days. Only remove the amount of eggs you want to use from the packaging and leave the other in the packaging in the refrigerator. Refrigerated eggs should not be left out of the refrigerator for longer than two hours. + Are Eggs Really The Cheapest Animal Protein? 18 eggs = 1 kilogram = 18 portions. 1 kg of any other animal protein food represents about 8 portions. Eggs are not subject to shrinkage when cooked, thus 1 kg of raw product is equal to 1 kg of the cooked product. + Can Eggs Be Frozen? Eggs can be frozen but not in their shells. Egg white can be frozen without any additions. Whole Eggs (mixed thoroughly) freeze excellently with the following additions: For every 12 eggs add - 5 ml salt or 20 ml sugar or 20 ml honey or 10 ml glycerine. Frozen eggs must be left to thaw before used. Eggs are special cells found in female animals. Nearly all animals produce eggs. Some animals lay eggs outside their body. For example, chickens lay oval, hard- shelled eggs. + What Is The Study Of Eggs Called? The study of eggs is called OOLOGY. + Egg Albumen Can Be Used For Wine Fining? For wine, fining means to add an absorptive or reactive substance to reduce or remove the concentration of one or more undesirable components. Fining agents are used to achieve clarity and improve colour, flavour and physical stability. Egg albumen is a common fining agent for red wines. Albumen is found in egg whites. Fresh eggs contain approximately 3 to 4 g of active product per white and are preferred over frozen egg whites. Albumen is colloidal in nature and has a positively charged surface that attracts negatively charged tannins. Egg whites remove fewer phenols and less of the fruit character than gelatine.